Let's face it, when the mercury tips 100 degrees and the plastic flowers are even starting to wilt, there nothing is better than supping on an ice cold glass of wobbly pops!!! 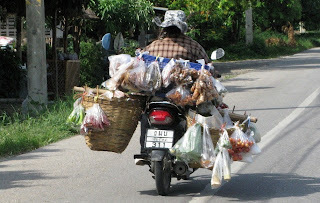 Although, if you're a member of Alcoholics Anonymous, Thailand isn't exactly the best place to hold your next meeting!!! I am well placed to comment on this aspect of Thailand, thanks to my penchant for the amber nectar and having consumed more beer over the years, than a coach load of hillbillies at a Klu Klux Klan convention. One of things that tourists often find strange is that the Thais drink their beer with ice!!! For the first time visitor this takes some getting used too, but it is an aspect of the drinking culture that I have come to accept. And you soon understand why this is the case when you're sitting in the sun and your beer starts going warm!!! In the next few paragraphs, I shall endeavour to provide information and tasting notes covering the most popular brands together with highlighting some of the less well-known beers. Singha beer is the oldest and most well-established of the beers in Thailand, having first gone into production in 1933. The beer is reminiscent of the pilsners found in Germany and the Czech Republic, this is mainly due to the fact, that the founder of the Boon Rawd brewery was trained by Bavarian Braumeisters. 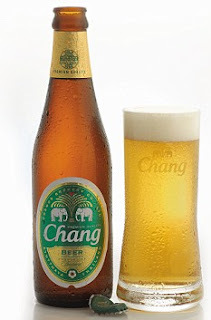 Singha used to dominate the local market but has lost ground in recent years to the new kid on the block, Beer Chang. The Boon Rawd brewery produces three beers under the Singha brand; namely Singha (6%), Singha Gold (4,8%) and Singha Draft (4,8%) . Besides Singha, Boon Rawd also makes a beer called “Leo” (5,5%) and its slighlty stronger cousin Leo Super (6,5%). It was also responsible for a brand called Mittweida (5%) and has also produced Kloster (5%), under licence from Beck's. Unlike some beers that use imported barley, Boon Rawd use grains that are grown in Thailand and this gives its Singha brand a distinct flavour. In my opnion the Singha beers (Singha, Singha Gold and Singha Draft) have a mild hop bitterness that is off-set by a malty sweetness. This sweetness is a characteristic which is fairly common in Asian beers. It is has a slight flavour of citrus fruits and a hint of spice which gives it a slightly dry finish. This means it is a great accompaniment to hot and sour Thai dishes like Tom Yam Gung. Make no mistake though, despite its sweetness, the 6% variety packs a punch like a mule and is responsible for some dreadful hangovers. This brew is one of the cheaper beers on sale in Thailand and was launched by Boon Rawd as a competitor to beer Chang. They were looking for a way to claw back some of the lost ground and decided to market this product at the lower end of the pricing scale. Leo is popular among Thai drinkers thanks to the value it offers, although, at a strength of 5.5% it is a lot milder than Chang and Singha, when Thai's tend to go for drinks with a higher alcohol content. 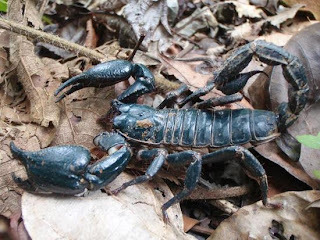 However, for some strange reason, it is not universally popular among foreign tourists or ex-pats and I have read some very disparaging reviews about it, saying it lacks flavour and tastes chemically. But in my humble opinion, I really enjoy it and whenever I'm in the Kingdom, Leo will be my tipple of choice. It's a simple, easy drinking beer when served ice cold, with a plate of Som Tam. I like to drink it with a slice of lime, as you would with a bottle of Corona. Leo is a very light and subtle beer with a floral aroma. There is a slight sweetness with overtones of honey and rice which gives it its smoothness and a nice mellow finish. I think it also has a mild peppery flavour which cleans the palate and doesn't leave any lingering aftertaste. I like to drink it with seafood or poultry dishes and it also goes well with noodle soup. The inimitable Beer Chang is prodcued by the ThaiBev company and was launched in 1995. ThaiBev is also noted for the production of the Sang Som and Mekhong brands of rum, and I hold them personally responsbile for at least 9/10 of my hangovers!!!! Beer Chang rapidly gained over 60% market share thanks to aggressive advertising and good old fashioned low prices. This has since fallen to to around 50% but it still remains one of the most popular beers among both locals and tourists. It is recognised as the beer of the working man and can be bought at almost any corner shop, bar or entertainment venue. However, some of the top end establishments might look down their nose at you if you order a bottle of Chang rather than a 1,500 baht bottle of Johnny Walker!!!! It is a deep golden coloured beer with a complex combination of aromas and tastes. It ranges from treacle to bitter hops to sweet biscuit. It has a robust constitution and it is this firmness of flavour that means it is perfect with most spicy or sweet and sour dishes. Chang used to be my preferred beer whenever I was travelling in Thailand, but the sheer strength of it at 6.4%, coupled with the bitter aftertaste and some very bad hangovers, led me to search for something new!!! However, if I'm having a BBQ then I will still reach for an ice cold Chang or 2 to whet the whistle. 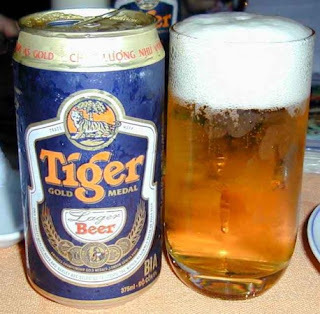 I know that Tiger isn't strictly a Thai beer, as it is made by Asia Pacific Breweries (APB) in Singapore. But it is common brand in Thailand and popular throughout SouthEast Asia, so I believe it is worthy of a mention here. The brand is well-established and dates back to 1931. It has an impressive history and boasts over 30 international gold medals. In my opinion Tiger is very light on the palate and has a very silky texture. It's has a balanced fruity flavour with sweet berries together a note of malt and a hint of honey. It comes in at about 5% in terms of alcohol content. I must admit that it is an acquired taste and I wasn't always a great fan of Tiger. I found it a little bit too sweet, but I'm happy to admit that it has grown on me over the years and I'm now more than happy to pick up a 4 pack at my local 7-11. I did say that I would bring you some of the less well-known beers and Beer Lao is certainly one of them. Although it is not a Thai beer, as I'm sure you've worked out from the name!!! But, such is the quality of this brew I thought it warranted a mention!!! It is made by the LBC (Lao Brewery Company) and is available throughout Laos. It is also increasingly common in western-orientated establishment, in neighbouring Cambodia and is slowly making inroads into the Thai market. If you do visit Lao there is a lovely draught version available known as biá sot, which I believe means "fresh beer" and it is very similar to the "biá hoi" you find in Vietnam. 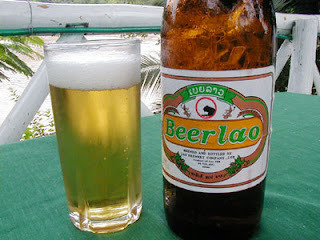 Beer Lao is one of my all time favourite Asian beers and is a fantastic blend of East and West. It is made using the local jasmine rice together with yeast and hops imported from Germany. The aroma is one of herbs and and grasses and the flavour is predominantly rich and buttery with hints of corn or cereals. You will also detect some fruitiness, with melon, pomegranate and mangosteen flavours being the most noticeable. Located in Bangkok, on Rama 3 just south of Silom, it’s a unique mix of Thai and Western both in terms of dining, entertainment and drinking. It is first and foremost an entertainment venue and features bands such as Fong Nam, fronted by the "unique" Bruce Gaston, but also hosts performances from leading Thai artists like Bodyslam. The microbrewery specialises in German style pilsners, dunkel (dark) and weizen (wheat) beers, all of which are extremely palatable. It's decor is similar to a Bavarian brauhaus with long wooden tables and benches. Patrons are encouraged to join in with the songs and rowdy atmosphere. Dunkel: It has a dark rich colour and warm aroma. I detected hints of burnt treacle, dark toffee and liquorice. It goes very well with lighter and more delicately flavoured Thai dishes and unlike some other dark beers it was not too heavy. Weizen: It is opaque in appearance with a good head. The aroma is fruity with a gentle hint of malt and hops. The initial fruity taste gives way to a light peppery and spicy flavour. This is great with fish and white meats. Overall they were both very drinkable and together with the good food and entertainment, I would highly recommend Tawandang. This venue is also in Bangkok and can be found on Soi 33 Sukhumvit. It is a traditional style English pub showing live sports and offering a selection of decent food including all your pub favourites. But, the main reason punters come to the Londoner, is for the beers that are made on site!!!! They are currently offering a pilsner style lager (London Pilsner 33) and an English Bitter (Londoner's Pride Cream Bitter). All the raw materials, as well as the expertise of the the masterbrewer, come from Europe. In my opinion this has created a winning combination. London Pilsner 33: This lager is very light and aromatic. It has sweet, grainy notes and there is also a good fruity punch. This is perfect accompaniment to any of the steaks they serve!!! Londoner's Pride Cream Bitter: This bitter is low in body and density but higher in alcohol (5.5%) than many bitters you find in the UK. There is a hint of spice and citrus and I instantly thought of Christmas and mince pies when I drank it!!! This tipple is perfect with roast beef and yorkshire pudding!! !